Kriti Sanon is being praised for her special dance number Aira Gaira in Kalank. In an EXCLUSIVE interview with Pinkvilla, we asked the actress if she wants to work with Karan Johar. Read what she said. Kriti Sanon has left everyone bewitched with her moves in the song Aira Gaira from Abhishek Varman's Kalank. After enthralling us with her dance number Aao Kabhi Haveli Par in Stree (2018), Kriti Sanon is back with one more special song. The actress has left everyone bewitched with her moves in the song Aira Gaira from Abhishek Varman's Kalank. The film stars Varun Dhawan, Alia Bhatt, Madhuri Dixit, Sanjay Dutt, Aditya Roy Kapur and Sonakshi Sinha in the lead roles. 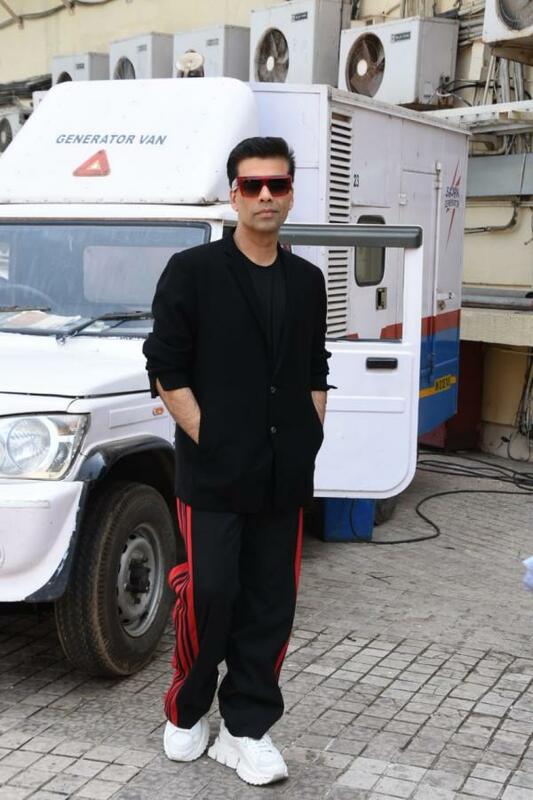 Kalank is the dream project of Karan Johar's father, late Yash Johar. He is the producer of this period love story which released today. In an EXCLUSIVE interview with Pinkvilla, we asked Kriti Sanon about working with Karan Johar and if she wants to do a film with him. Kriti told us, "I have always wanted to work with Karan Johar and he has been on my wish-list since a very long time, much before I came to Mumbai. I always wanted to work with him even before this song." She further added, "I am glad that I got this opportunity to start my relation with Dharma Productions. He gave me such a kickass number. I wish that we sort of do a lot of work together and collaborate on really amazing stuff. Hopefully soon in the near future." The actress also told us that when Karan Johar had called her to do the song, she immediately jumped on the opportunity. Kriti Sanon told us that she loves dancing and as Karan Johar is very passionate about music, she was sure the song would be catchy. Have you watched Kalank? Let us know your views in the comments section below. No, hooney, stay away of Kjo. A few years back, Shraddha was behaving like Kriti. She did an item song for a Kjo's movie and she even acted for free in a disaster Dharma production with Kareena Kapoor and Irfhan Khan. Maybe she taught that, with such things, she could show her talent and dedication to Kjo. At the end of the day, Kjo gave her a mediocre adaptation of a south movie and he tried to bring Shraddha down with stupid rumors and bad press. Luckly, Shraddha has learned the reason and now she knows that she doesn't need a mentor like Alia. Shraddha is working by herself, getting good oportunitties due to her talent and hardwork. He was so rude to her on kwk, yet she's buttering him up. Anyone praising Kjo as a great movie maker makes me wanna puke. He makes shallow movies with ridiculous plotlines. I agree with you that Alia is mousey but why must we promote extremes in height?? Alia is like a midget but Kriti is too tall and big/wide boned compared to most male actors, and her head is so big. She IS prettier than Alia x10 but there are several women of more reasonable heights and body structures than her. The reason these 5'10 giant women gets roles is because Bollywood is lazy and either does nepotism or auditions directly from runway modeling agencies like Elite. Gone are the days of auditioning print/ad models like Preity or ACTUAL aspiring actors like Kangana. She seems desperate! Chill girl! As long as there is nepo Alia, you don’t stand any chance. Why does everybody say she is so pretty? All she has is light skin but apparently that's enough to impress Karan. Look at her and her sister's pre-fame pictures. Both looked like witches and were not fair or even wheatish skin at all! Girls - News flash. Karan Johar does not make good movies. In fact, even the movies he produces are mediocre. She seems to be too desperate n jealous of Alia...except good manly looks she has nothing. She could have gotten a better role , but that wasn't her wish. Apart from that her song aira gaira is going to be a hit. She could have done Alia role. But Nope!! Kjo will not let anyone be the lead other than his mediocre minion!! She keeps saying she is an engineer and now she is an Item Girl! Wow what a promotion, especially after all that debate of objectification of girls and women, anything for money and KJO! Disgusting!! Karan could have given her Sonakshi’s role..